Balinese influenced architecture and gardens, and a desirable location, make the small Surya Beachfront complex a perfect holiday destination. Stylish and serene in feel, with calming water features, this small group of townhouses has a fantastic location. Separated from Four Mile Beach by a small park, there are no roads to cross. A fantastic getaway for couples or young families. 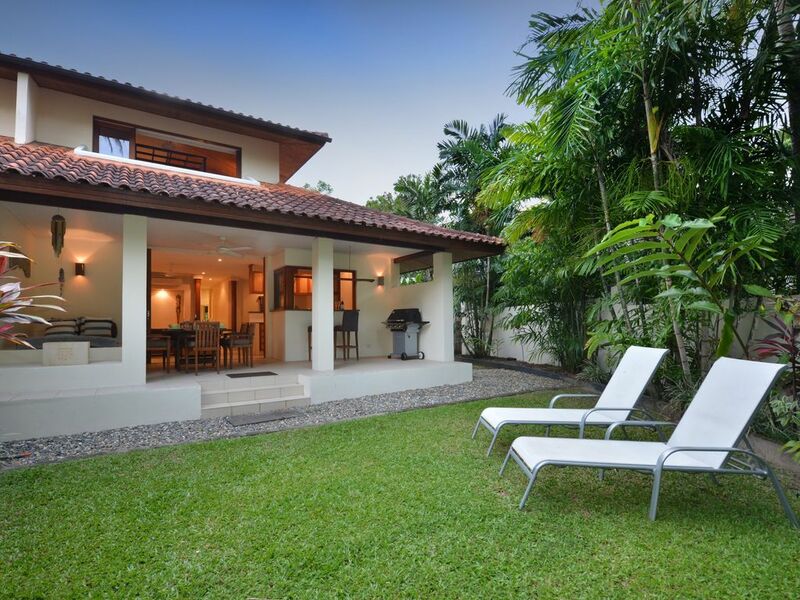 Villa No.1 has its own private garden with grassy area and a gate leading to the park and beach. The living area has a lounge with comfortable seating, a TV and DVD. The formal dining area has seating for six. Sliding glass doors from the living area open out to a covered veranda with extra dining table and chairs as well as a large in built daybed, servery from the kitchen and barbeque. The kitchen is conveniently located between the indoor and outdoor dining areas. Food preparation is made easy with modern appliances including a dishwasher, microwave, ceramic hob and oven. The cupboards are fully stocked with crockery, glassware, cutlery and cookware. The spacious master suite is on the upper level with views from the veranda over the park to the beach, an office nook and generous en suite bathroom with bathtub. Downstairs are two spacious bedrooms which share a second bathroom. The villa has full air-conditioning and secure underground parking for two cars. There is access to a 21 metre lap pool within the complex. Enjoyed our stay and the staff were very attentive and friendly. Highly recommended.